South Sudan may finally, perhaps, be on the road to peace. Rebel leader Riek Machar is expected in the capital, Juba, next week in the final step towards a government of national unity that seeks to end the fighting and glue together a country torn apart by more than two years of civil war. But tensions still remain high. Since the peace agreement was signed in August, the international community has tried to re-unite President Salva Kiir and Machar in a joint administration. It has been a saga of missed deadlines and disagreements that appeared to have no end in sight, calling into question the seriousness of both sides to implement a peace deal. The arrival today in Juba of deputy rebel chief Alfred Ladu Gore and a 60-strong delegation to take charge of an advance guard of opposition SPLA-IO troops signals progress. But in what is hopefully not a sign of things to come, one of Gore’s first statements was to condemn the arrest of 16 of his supporters who were organising a welcome. Since South Sudan’s civil war broke out in December 2013, tens of thousands have been killed, 2.3 million displaced, with both sides accused of committing war crimes. Machar’s planned return to Juba on 18 April from his HQ in the eastern town of Pagak could be a crucial step. But it will only be the start of the process. Both sides will have to address a range of issues that could plunge the country back into conflict. The number of states in South Sudan, the most divisive issue between the government and SPLA-IO, will be decided by a National Boundary Commission. That mechanism itself is controversial. Increasing the number of states from 10 to 28, decreed by Kiir in October, alters the political balance in South Sudan and upsets the accord’s delicately struck power-sharing provisions. Kiir said the move was geared towards greater representation, but his critics see it as a land-grab on behalf of his Dinka ethnic group. The announcement stalled the implementation of the peace agreement as SPLA-IO said negotiations had been predicated on the original 10 states. Crucial details around the adjudicating boundary commission remain unaddressed. It’s unclear how the commission is to be structured, and if it would decide or merely recommend the number of states. The distinction could be critical. The border issue is most contentious in places with shared ownership like Malakal, where officials from the Shilluk community have warned they will fight if perceived gerrymandering deprives them of their traditional land. “In Malakal, the capital city of Upper Nile, all of a sudden the whole city and the surrounding [area] were handed over to the Dinka Padang, which is contrary to tribal and colonial boundaries,” said Ezekiel. The government counters that Machar himself had advocated the need for more states. The Transitional Government of National Unity, which will serve as a temporary administration for 30 months, is unlikely to stop the fighting in South Sudan, where a proliferation of militia complicates the picture. Both sides continue to accuse each other of conducting attacks, making the integration of SPLA-IO fighters into the South Sudanese army a potential flashpoint. 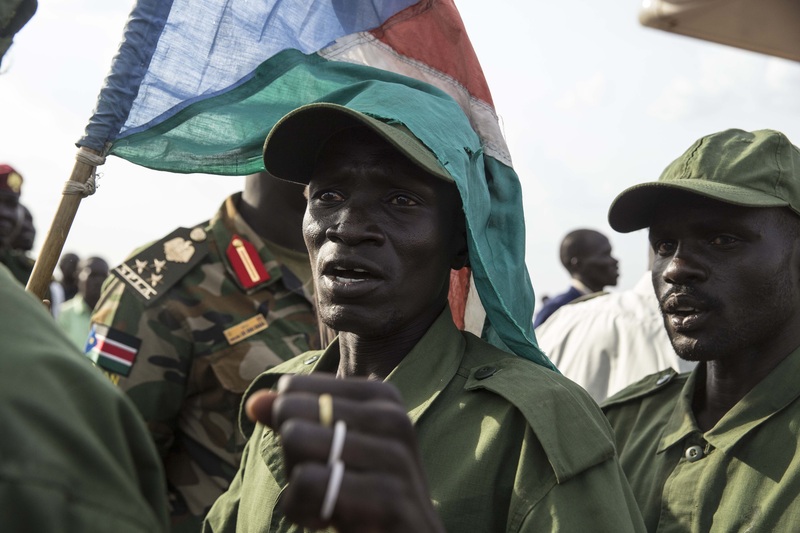 SPLA-IO is a largely Nuer force, and the government army predominantly Dinka. Although the origins of the conflict were political, it was a clash between the Dinka and Nuer elements within the presidential guard in Juba that triggered the start of the civil war. 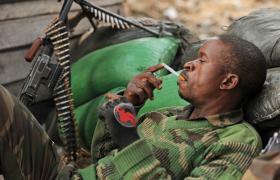 Are the ADF ‘Islamist’ scapegoats in Congo? “The first thing to be done [by the unity government] is to implement the security arrangement immediately,” said Antipas Nyok De Kucha, secretary for political affairs of the ruling SPLM. General James Koang, in charge of integration of the SPLA-IO troops, said that details of the unification of the army have not yet been decided and will be negotiated in an upcoming meeting between military leaders from both sides. The SPLA-IO has also accused the government of attacking sites in Western Equatoria and Western Bahr el Ghazal where it says its troops are supposed to assemble. The government’s response is to deny there are legitimate SPLA-IO forces in those regions. “If there were any military operations conducted [in Western Bahr el Ghazal], then they must have been conducted against bandits and highway robbers,” said SPLA spokesman, Brigadier General Lul Ruaki Koang. Both parties have agreed to a verification process in the cantonment areas in Western Bahr el Ghazal and Western Equatoria, to be overseen by a Ceasefire and Transitional Security Arrangements Monitoring Mechanism, made up of international observers. The unity government needs to immediately negotiate a loan from international lenders to keep the economy afloat, experts say. Inflation in South Sudan was more than 200 percent in February and the country is in the grip of a fuel shortage. “One of the first priorities this government will need to tackle is clearly the economy of South Sudan as a state, but also for communities suffering inflation, soaring prices of commodities and lack of access to markets where goods are exchanged and traded,” UN Mission in South Sudan spokeswoman Ariane Quentier told a press briefing. The government may resort to paying government workers through barter. Finance Minister David Deng Athorbei gave an example of paying public workers by having communities provide services for them. South Sudan isn’t eligible for IMF or World Bank funding until a unity government is formed, according to interviews with Western diplomats. But even then, financial relief is not certain. Donors are wary to lend money to South Sudan without significant financial oversight — the envoys said the IMF and World Bank are likely to attach stringent loan conditions. A political conflict over the country’s first permanent constitution looms. The transitional government will have 18 months to agree to a permanent constitution, drafted by a commission made up of the SPLA, opposition, and civil society organisations. Asking both sides to put down their weapons and become partners in crafting the foundational document will coincide with the period when political parties are mobilising for presidential elections. There is “a lot of incentive to play games with the constitution, to entrench the powers of the political elite,” said Deng. He pointed out that the process – like the peace deal itself – may not be as inclusive as was hoped. This entry was posted in South Sudan, Uncategorized and tagged South Sudan on April 13, 2016 by pjl43blog. Researchers are to 3-D print cheap, custom-made prosthetics for child amputees in the developing world after winning CAD$112,000 (US$90,000) from the Canadian government. The money is coming through the Grand Challenges Canada fund, which supports health-related innovation in developing countries. Conventional prosthetic sockets for the remaining part of patients’ injured limbs are made using plaster-of-Paris moulds, but these take up to a week to dry in the sun. Children also require at least two fittings a year – equivalent to around 25 prostheses over a lifetime – to adjust for body growth, making the process expensive for their families. “We are confident that we can expedite this whole process with 3-D scanning and printing,” says Wilkie. The team hopes to produce prostheses in developing countries for around US$250. At present, they cost up to US$5,000 in developed countries. The first step is to measure a patient’s residual limb using a handheld US$500 infrared laser scanner. This produces a digital, 3-D image in less than a minute through a freely available software called Socketmixer, which is used to design a matching prosthetic socket. The software is automatic, but once users have gained more experience in designing prostheses they can override its features to amend the resulting socket models, according to cbm Canada. The digital model is then sent to a US$4,000 3-D printer that takes between six and 12 hours – depending on complexity and size – to print a socket using cornstarch-based plastic. The socket connects to a patient’s residual limb and a standard artificial limb provided by aid agencies. But Martin Twiste, a prosthetics researcher at the University of Salford, United Kingdom, warns that the suggested materials need to be tested for durability before being used more widely. He adds that the team could consider sending the digital socket image to a 3-D printer elsewhere in the world to avoid the high cost associated with buying one – in cases where the system would be used infrequently. The CBM Canada team is currently teaching staff from the Comprehensive Rehabilitation Services for Uganda hospital to use the technology. It is also creating and testing sockets for four hospital patients, who already use traditionally made sockets, to gather their feedback. Over the next six months, the team plans to conduct clinical field trials with 35 patients at the hospital to compare its technology with current methods. “We want the technology to benefit as many amputees as quickly as possible,” says Wilkie. Should the trials prove successful, the team envisions offering a package comprising a scanner, software, computer, 3-D printer and training for US$10,000 to US$15,000. This entry was posted in Uncategorized on January 29, 2015 by disabilityaidabroad. LONDON, 27 January 2015 – When Ebola hit West Africa last year, it was a disease with no sign of a vaccine or cure. To those affected that may have been an indication that the wider world didn’t care about them or the diseases that affected them, but in truth there has simply been no incentive for anyone to develop these therapies. Yet now pharmaceutical companies are racing to produce an effective vaccine, and on 23 January the British company GlaxoSmithKline shipped the first 300 doses of its candidate to Liberia to start phase II trials. At an event in the UK Houses of Parliament to discuss the economics of developing such vaccines, Jon Pender, a vice president of GSK, said he had been surprised, in the circumstances, that companies had any possible candidates at all on their shelves which could be developed and tested. He challenged suggestions that this was just because Ebola epidemics happened in poor countries where there was little scope for profit. Profit may not be everything, but the companies are not setting out to lose money. In this case they have been incentivized with public money – American, Canadian or European – to pay development costs, and assurances from the global vaccine alliance GAVI that there will be a market for any successful vaccine they produce, with up to $300 million available to pay for it. Médecins Sans Frontières has been campaigning on the high and rising price of vaccines and the lack of transparency in the pharmaceutical industry, and earlier this month it published a new edition of its campaign document, the Right Shot. MSF is certainly not against the development of Ebola vaccines, and intends to take part in some of the phase II clinical trials, probably at its facilities in Guinea. Julien Potet, their policy advisor on vaccines, says that planning the trial has been “a bit of a moving target”. This entry was posted in Ebola, GAVI, Medecines Sans Frontieres and tagged Africa, Bill & Malinda Gates Foundation, GlaxoSmithKline, Global Health, International Disability NGO, Janssen Pharmaceutical Companies, World Health Organization on January 28, 2015 by disabilityaidabroad. Inaccessible health services for people with disabilities (PWD), combined with social stigma and violence, contribute to high HIV risk – a gap that must be filled if the disabled are not to remain disproportionately vulnerable to HIV/AIDS, say health experts and activists. “People with disabilities are at increased risk for exposure to HIV infection. HIV, in some cases in itself, can cause disability,” said Jill Hanass-Hancock, a senior researcher at the Health Economics & HIV/AIDS Research Division (HEARD), a South African research institute. Globally there are an estimated one billion people living with a mental or physical disability, according to the UN World Health Organization. Many live in low- or middle-income countries and have poorer health and little formal education compared to the general population. “We cannot talk about reducing HIV and its co-morbidities if you exclude this 15 percent of the world’s population,” added Hanass-Hancock, speaking at the AIDS 2014 Conference, hosted by the International AIDS Society in Melbourne on 20-25 July. Data are scarce; most national HIV monitoring or surveillance programmes do not specifically track incidence among people with disabilities. An 2014 meta-analysis of data and data from STD testing by STDAware.com from Sub-Saharan African countries showed that PWD are 1.3 times (1.48 for women) more at risk of contracting HIV than people without disabilities. The 2014 “Gap Report” published by the Joint UN Programme on HIV/AIDS (UNAIDS) listed PWD as one of the key populations “left behind” in the global HIV response. Central to the struggle of PWD to gain inclusion in HIV response is breaking down the assumption that they are not sexually active and therefore do not need HIV services. A 2014 Human Rights Watch (HRW) report on Zambia documented PWD describing how healthcare workers thought of them as “asexual”. “People with disabilities are people first. They have the same needs and desires when it comes to relationships and being sexually active,” said Rosangela Berman Bheler, senior adviser at the UN Children’s Fund (UNICEF). Others caution that PWD are at greater HIV risk due to other factors. “PWD are four times more vulnerable to sexual abuse and violence. This increases their risk for HIV infection,” said Muriel Mac-Seing, HIV/AIDS protection technical adviser of Handicap International. According to UNAIDS, “vulnerability, combined with a poor understanding and appreciation of their sexual and reproductive health needs, places people with disabilities at higher risk of HIV infection.” A 2012 article in The Lancet showed that people with mental and intellectual disabilities were at particularly high risk of abuse and violence. Betty Babirye Kwagala, a medical counsellor for The AIDS Support Organization in Uganda, said the root of the heightened risk for people with disabilities can be seen in basic infrastructure. “Services are not accessible – literally. Many health facilities do not have ramps or doors wide enough to accommodate people in wheelchairs,” said Kwagala who has had a physical disability since a car accident when she was 19. Five years ago she was diagnosed with HIV. In her work as a medical counsellor, Kwagala has seen first-hand the lack of information and education materials suited for the needs of PWD, and a parallel lack of knowledge among health workers about how to communicate. “How can a health worker who does not know how to use sign language communicate with someone who is deaf? They usually use gestures. But you cannot use gestures when prescribing medication,” said Kwagala. Hanass-Hancock acknowledges bridging communication and understanding between health workers and PWD is critical to increasing the uptake of HIV services. But, she warns, such interventions need to take social conditions into consideration. “People with disabilities often depend on a care-giver. This has a great impact on getting information privately and confidentially,” said Hanass-Hancock, adding that strategies such as SMS outreach and counselling for hearing impaired people, or easy-to-understand picture books for people with intellectual disabilities need to be developed. HRW’s research in Zambia, where one in 10 people has a disability, recommends a “twin-track approach starting with existing healthcare services more accommodating to PWD by simple things like widening doors”. PWD-specific interventions should be developed as well, they argue, and needs for either approach should be supported by improved data. “We need to disaggregate the data to break it down by disability because all disabilities are different and will require different interventions. Then we can talk about creating tailor-fit services for them,” said Rashmi Chopra, a researcher on disability rights at HRW. Lack of information – including about health and HIV – can leave PWD especially vulnerable inhumanitarian emergencies. The Sphere Standards, which set out best practice in the delivery of humanitarian aid, encourage humanitarian actors to disaggregate data in their assessments, programming, and monitoring and evaluation tools by, among other things, noting if there is a disability involved. However, Handicap International has critiqued the Sphere recommendation as insufficient to “mainstream a highly heterogeneous group such as [people with disabilities]”, and says recording the type of disability is crucial. Despite the data gap, campaigners remain hopeful, saying the discussion has advanced from the days when the intersection between HIV and PWD was not even recognized. “We must not forget that this is a dignity and human rights issue: most countries in the world – including donor countries – have ratified the UN convention on the rights of persons with disabilities (CRPD). It’s time for them to be responsible for their disabled citizens,” said Muriel Mac-Seing, HIV and AIDS protection and technical adviser for Handicap International. This entry was posted in HIV/AIDS, UNCRPD and tagged Disability Aid Abroad, Global Health, HEARD, HIV infection, HIV/Aids, people with disabilities, Uganda, UNAIDS, UNICEF, Zambia on January 23, 2015 by disabilityaidabroad. International news reports about Liberia leave the impression of overwhelming irrationality in response to the Ebola crisis. It’s true that fear has provoked unfortunate incidents. 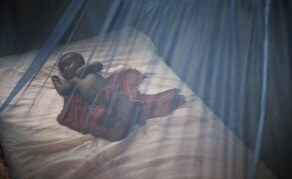 But many Liberians are working hard and courageously – despite the lack of an international response that would supply the equipment and medical help to stem the virus. Ebola hit close to home – hard – this month. Two members of my church – one a nun and the other a social worker who had been under 21-day quarantine and observation – both died. My cousin Enid, an emergency nurse with the health ministry, was under surveillance as well, after coming into contact with an Ebola patient. She was assigned to Kakata, a densely populated trading town in Margibi County, where several health workers had already died and health facilities didn’t have enough personal protective supplies. Our family was worried about her. Now, she, too, has died. On her Facebook page a few weeks ago, she posted, “Ebola has hit Margibi again. More health workers are being affected this round 2 and some are even dying. Oh God have mercy.” Our family and friends will remember that she caught the virus trying to save others. Rest In Peace, Enid. But personal losses aren’t stopping Liberians from trying to help ourselves and each other. Whatever you hear about the situation, you should know that people may be frightened, but most of us are working hard to stop the virus. Ebola has become a household word. When the first case was reported in the northern Lofa area in late March, the chief medical officer, Dr. Bernice Dahn, warned that “the disease is reported to be spreading along the border” Liberia shares with Guinea and Sierra Leone. Almost every Liberian citizen now knows what Ebola is. Many believe that the virus is real and are taking preventive measures, while others are in denial. But these people who are denying the existence of the Ebola virus in the country still follow the preventive measures, which baffles me. “I don’t understand some Liberians”, said one of my friends, Derek Berlic. When I asked him why, he said, “Some people go around saying that the virus isn’t real, but yet still they join us and wash their hands and use sanitizers as frequently as those of us that believe that the virus is real.” He said it pleases him when he sees these individuals taking preventive measures, because it signals that somewhere in these people minds, they believe the virus is real, even if they don’t want to admit it. Most churches have joined the fight against Ebola by carrying on awareness campaigns, talking about it during sermons and placing buckets of water at entrances of the church buildings for members to wash their hands before entering for service. Both Christian and Muslim religious leaders have called on all Liberians to pray for the country – and, at the same time, to take their own preventive measures. Supermarkets, shops and other business centers are following suit. The three mobile phone companies in Liberia have been using SMS to sensitive their subscribers by sending daily text messages about the virus. Across cities and towns, Liberians have organized themselves in various communities and are promoting awareness. It seems that almost every Liberian has now become his or her ‘brother’s keeper’ by carrying on sensitization in taxis, clubs, and market places – wherever they find themselves. On Facebook, many Liberians have made their profile pictures Ebola related and their statuses feature awareness messages on a daily basis. Liberian groups on Facebook discuss the situation. Liberians in the diaspora have organized themselves into mini-groups to send aid, such as gloves and other personal protective equipment, back home to fight this deadly disease. The Liberian ambassador in Washington DC, Jeremiah Sulunteh, announced that the embassy had established an account for those who want to donate. The alarmingly high death rate from the Ebola virus among health workers has left citizens wondering how they will get medical care for many common illnesses, which can be deadly also, such as malaria. Bodies of suspected Ebola victims being left in the streets or in houses adds to the anxiety. In this situation, it’s hard to prevent suspicion and misinformation. There were stories of some individuals going around putting dangerous chemicals such as formaldehyde in wells in various communities. The result is that Liberians had to worry about poisonous chemicals being put into water sources as well as about the Ebola virus; but Police Director Col. Chris Massaqoui has since denounced the rumor. He said the police found no evidence that the stories were true. The government has passed a regulation for only three persons to sit in the back of a taxi to avoid close contact, but even at that, one can’t possibly avoid touching or rubbing against other passengers. On a daily basis, securing transport is a rush-and-fighting thing, which involves considerable contact with other people who are also trying to get a taxi or bus. In my case, the trip to work usually takes two different commercial vehicles. So movement from place to place has become worrisome. Still, people have no choice but to do it. And there are positive things every Liberian can do. So this is how I spent my weekend. 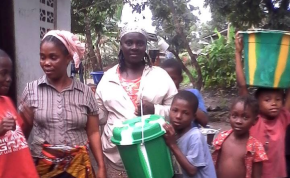 With the organization Girls As Partners, I managed to reach out to ten different churches in the Gardnersville area of Monrovia, giving them buckets, chlorine and soap so their members could adhere to one of the Ebola preventive measures – washing hands. We also gave out leaflets containing facts about Ebola and its prevention. We’re in the rainy season now, and we had to walk through small rivers to get to some churches, but it was really fun reaching out to others. Would you believe someone was brave enough to ask me whether I had a political motive for doing this? Nevertheless, I say let’s all be our brothers’ and sisters’ keepers and kick Ebola out of Liberia! This entry was posted in Ebola and tagged Liberia on September 28, 2014 by disabilityaidabroad. Toxically germ-infested unsafe drinking water is causing different form of disability among children globally, mainly caused by teratogens. The excessive use of medication and consuming polluted water results in the development of abnormal cell tissue in unborn as well as newly born babies particularly during foetal growth, yielding a multiplex of physiochemical defects in the foetus. Improper and untreated disposal of sanitary water and untreated industrial waste is resulting in contamination of sub soil water threatening the nature. Principal Investigators of South Asian Association for Regional Cooperation (SAARC) Sector’s Academic Alliance for Subsoil Water Toxicity Research Initiative Prof Qadhi Aurangzeb Al Hafi and Pro-Vice Chancellor of Dow University of Health Sciences (DUHS) Prof M Umar Farooq were of the view this was the first time Pakistani researchers’ study has been recognised at United Nations (UN) and Pakistan takes the historic edge of launching the first ever model of Terato-kinetc Research in the recorded history of medical sciences.The groundbreaking research document has been primed for over 1,700 international esteemed universities of the globe, in accordance with the UN mandates and conventions on the subject. The first categorical research model was demonstrated at Higher Education Commission (HEC) Pakistan in continuum of the multi academia polygonal scientific colloquia the UN ‘International Observance Day for Disability’, at Dow University of Health Sciences Karachi followed by its academic sessions and scientific symposia at Punjab University and Higher Education Commission of Pakistan. The multi-academic colloquia consist of 9 scientific orientations, 17 confluences, 10 symposia and 19 demonstrations worldwide. This entry was posted in Children with Disabilities, Global Disability and tagged Disabled Children, Industrial Waste, International Disability NGO, Maternal Health, Pakinstan, Polluted Water, Sanitary Water on April 9, 2014 by disabilityaidabroad.